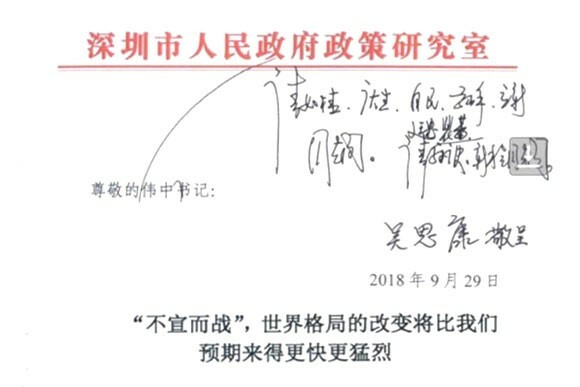 A screen shot of the leaked internal file personally signed by Wu Sikang, the director of Development and Research Center of Shenzhen City , and addressed to Wang Weizhong, the Communist Party Secretary of Shenzhen City, with Wang Weizhong's comments and instruction asking other city leaders to read this file. In the narrow “window” that remains before China is completely blocked by the United States from importing key technology, Beijing should use “unrestricted” and “supernormal” means, including “more precise, better concealed, and special ways,” to expedite the process of acquiring overseas talent and cutting-edge equipment, according to a leaked internal Chinese government document. The 12-page proposal, titled “An Undeclared War: The Change of the Landscape of the World Will be Faster and More Dramatic Than We Have Expected,” is in two parts. The first part gives a detailed overview of the undeclared “New Cold War” between the United States and China, while the second part lists six recommendations of what China should do to get an upper hand in the fight. The document was drafted by Wu Sikang, the director of the Development and Research Center of Shenzhen City, on Sept. 29. The copy obtained by The Epoch Times was signed by Wu and presented to Wang Weizhong, the Communist Party Secretary of Shenzhen City, the most important political figure in a major industrial city of more than 12 million people. After reading it, Wang asked on Sept. 30 that this file be sent to Mayor Chen Rugui, First Deputy Mayor Liu Qingsheng, Deputy Mayor Ai Xuefeng, and several other chief party and government leaders. On Oct. 11, Ai Xuefeng then ordered members of the Development and Reform Commission of Shenzhen City to read, study, and evaluate recommendations in the file, as shown in the “Form of Carrying Out Written Instructions of City Leaders” obtained by The Epoch Times. 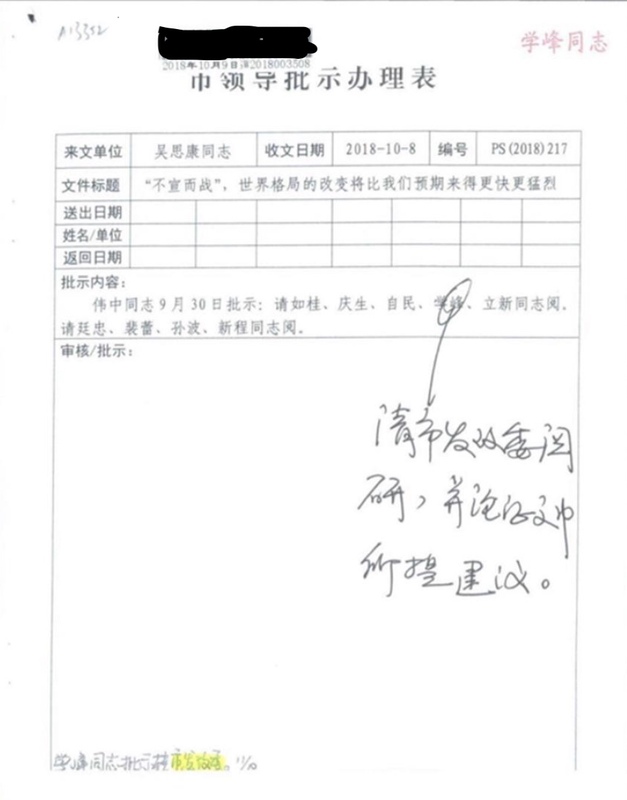 A screen-shot of the “Form of Carrying Out Written Instructions of City Leaders”, with instructions of deputy mayor Ai Xuefeng, asking this file to be sent to members of the Development and Reform Commission of Shenzhen City for them to read, study and evaluate the recommendations in the file. This recommendation indicates China needs to do research and make judgments in advance to predict what kind of talent they will most need, and then seek individuals who come from third-world countries, but who have completed their education in developed countries. These candidates should be given better salaries and rewards, as enticements to help them make the decision to move to China and continue their careers there. The file also mentions that China should learn a lesson from the “Thousand Talents Plan,” which drew the attention of the FBI and became a focal point. Therefore, when courting individuals, a low-key approach is essential in order to avoid attention from the outside world. The proposal says that the gap between China and the United States mainly manifests itself in the area of scientific equipment and instruments. While the United States might mobilize its allies to enlarge the scale of high-tech product export restrictions against China, there might be up to a full-year “window period” before actual actions can be taken. In this suggestion, China needs to bring together the world’s top minds in science and technology to set up information and data centers, while taking advantage of easy access to international science and technology data from Hong Kong. The proposal offers the example of Facebook’s market value dropping by $50 billion, as well as the company possibly facing a fine as high as $2 trillion, as a consequence of 50 million users having their personal data leaked. China doesn’t have to worry as much about encountering the same situation as Facebook, since, while China has over 1 billion internet users, there isn’t much of a sense of privacy protection. “This, to look at it dialectically, is also our opportunity to develop an internet-based economy. We need to seize this time window to expedite the development of new economic and business models to get an upper hand in global, internet-related business competition. The sixth recommendation is “to create a highland for industrializing global scientific and technological achievements, and to provide comprehensive, undifferentiated support for non-Chinese international talent” and to establish organizations to provide services for the benefit of the foreign talents. The Development and Research Center of Shenzhen City, which produced this proposal, is part of a nationwide system of governmental policy research and consultant bodies. The highest-level center, the Development and Research Center of the State Council, was founded in the 1980s during the rule of former Premier Zhao Ziyang. While the leaked file was only from a city-level development and research center, its messages were nonetheless important for the outside world to learn, economic analyst Qin Peng says. Wu Sikang, the author of the proposal, was a special invitee at a special economic symposium hosted by Chinese leader Xi Jinping in 2016, making Wu a very active expert, Qin noted. While the Chinese Communist regime’s position in the leaked file doesn’t differ from its long-standing policy of stealing and gaining by all means possible, Qin said he was particularly struck by the fifth recommendation, which shows the communist regime is ready to take advantage of loopholes in China’s legal and social system to profit from internet users’ personal information. Qin said the mention of differences between the legal and institutional systems of the United States and China, in connection with biomedical products, could mean that the Communist regime is ready to use Chinese people for medical testing that isn’t allowed by U.S. laws and regulations. Shenzhen has been a model zone for China’s openness and reform, as well as high-tech product manufacturing, Qin says, and plays an important role in “Made in China 2025,” the ambitious plan for China to gain dominance over the cutting-edge technologies of our time. In his 2018 annual government report, Mayor Chen Rugui vowed to build Shenzhen into a “model zone for ‘Made in China 2025. '” The goal is for Shenzhen to become the front-runner and a strong international manufacturing city in intelligent manufacturing, green industry, and high-end manufacturing by 2025.